Ishmael Lane made shots with the highest degree of difficulty Wednesday night, and nearly posted the first triple-double in eight years by a Northwestern State basketball player. One situation produced Lane’s most incredible score, a twisting, fallaway 3-pointer from 30 feet, beating the shot clock buzzer with 2:57 to go in regulation, after NSU inbounded opposite its bench with two seconds left to shoot. His other buzzer-beater forced overtime. Down by two with 9.4 seconds left, coming out of an NSU timeout, point guard C.J. Jones calmly moved upcourt and flipped a short pass to Lane, who nailed a shot just behind the free throw line for a 69-all tie. It was the second dramatic Privateer win over the Demons in seven days. After a contest in regulation that had 17 lead changes last Wednesday, it took extra time to settle the rematch, which had 11 lead changes, including swaps on six straight possessions over a four-minute stretch late in the second half. 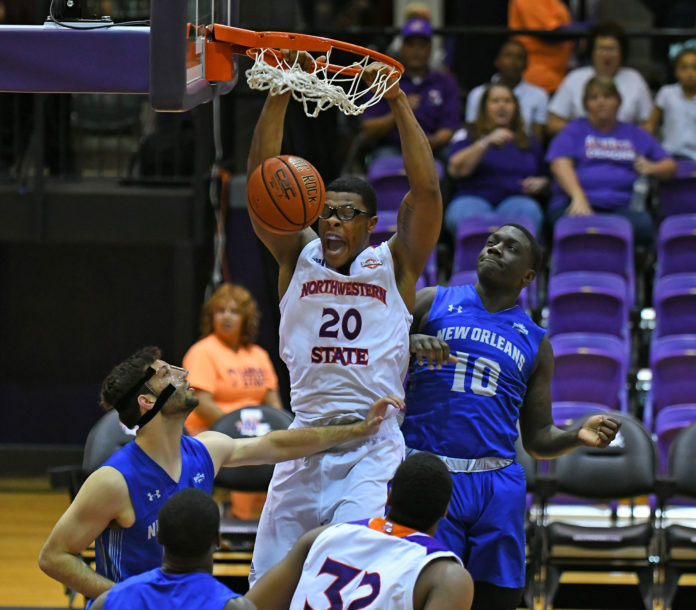 With NSU short-handed due to another injury sustained by freshman point guard Brian White, who had scored 11 points in Saturday’s win at Central Arkansas, Jones raised his production, dumping in a season-best 14 points and handing out four assists in a season-long 33 minutes. Sophomore center Larry Owens added 11 points while classmate Vonte Ott contributed nine, going 5-for-5 at the free throw line. Otherwise, the Demons combined for 6 of 16 aim there, while the Privateers dropped in 20 of 26. “We didn’t make the free throws we needed to, but we didn’t get to the line nearly enough, just once in overtime, in a very, very physical game,” said McConathy. “It’s disheartening because we didn’t get it done but man, what a great effort. That was a 15-3 eruption, fueled by defense, over nearly a five-minute stretch as the Demons wiped out a 10-point deficit and went up 57-55 with 7:08 left. In overtime, an Owens basket drew NSU even at 73, but UNO sank three layups and a dunk in the final 2:28 while NSU suffered two turnovers and missed a pair of shots on four straight empty possessions. The Privateers got 31 points and five steals by Ezekial Charles to help overcome 39 percent shooting to 51 percent by the Demons.